University of Iowa Student Report Saturday, May 10. 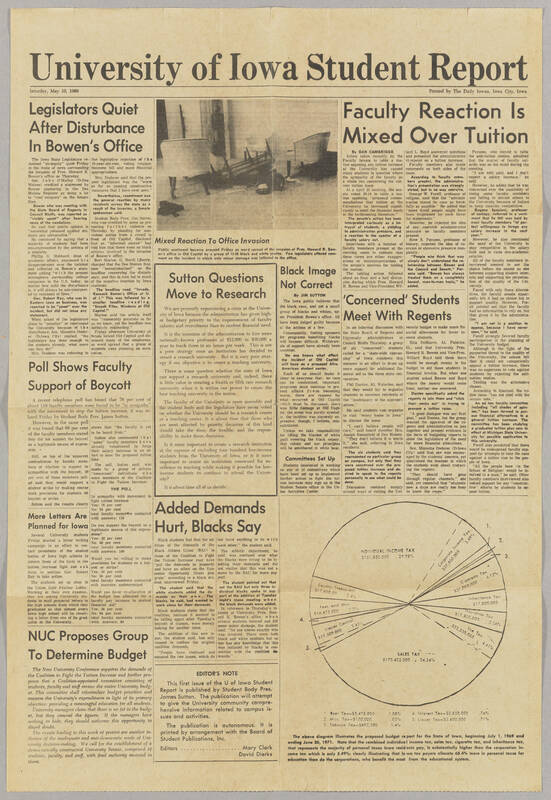 1969 Printed by The Daily Iowan, Iowa City, Iowa Legislators Quiet After Disturbance In Bowen's Office The Iowa State Legislature remained "strangely" quiet Friday in the wake of news surrounding the Invasion of Pres. Howard R. Bowen's office on Thursday. Sen. John O'Malley (D-Des Moines) credited a statement by Bowen appearing in the Des Moines Register as doing a lot to "cool tempers" on the Senate floor. Bowen who was meeting with the State Board of Regents in Council Bluffs was reported as "visibly upset" after hearing news of the vandalism. He said that public opinion is "somewhat poisoned against students and universities." He continued by saying that a majority of students had been mis-represented by the actions of a minority. Philip G. Hubbard dean of academic affairs, expressed his disappointment over the incident and reflected on Bowen's statement adding "with the present atmosphere surrounding college campuses in the U.S. today no matter how mild the disturbance is it will always be mis-interpreted by residents of Iowa." Gov. Robert Ray, who was in Eastern Iowa on business was reported to be "upset" over the incident, but did not issue any statement. When asked of the legislature plans to "penalize" or reprimand the University because of the disturbance Sen. Minnette Doderer (D- Iowa City) replied, "the legislature has done enough to the students already, what more can they do?" Mrs. Doderer was referring to legislature rejection of the 19-year-old vote, voting reapportionment bill and more financial appropriations, Mrs. Doderer said that the present legislature was the "worst as far as passing constructive measures that I have ever seen." Nevertheless, resentment was the general reaction by many residents across the state as a result of the invasion, a Senate spokesman said. Student Body Pres. Jim Sutton who was credited by some as preventing further violence on Thursday by pleading for non violent action from a crows in front of Old Capitol, disclosed that an "informed source" had told him that there were no black athletes involved in the invasion of Bowen's office. Bert Marion, G. North Liberty charged that the Des Moines Register "sensationalized" on the headline concerning the disturbance and this in turn led to much of the negative reaction by Iowa residents. The headline read "Invade, Ransack Bowen's Office at U of I." This was followed by a smaller headline reading, "Smash Files, Windows at Old Capitol." Marion said the article itself was "reasonably accurate as far as we know, yet the headline was definitely misleading." Friday afternoon University officials locked Old Capitol and dismissed many of the employees as word spread that a group of students were planning an occupation. Poll Shows Faculty Support of Boycott A recent telephone poll has found that 76 per cent of about 110 faculty members were found to be "in sympathy" with the movement to stop tuition increase, it was related Friday by Student Body Pres. James Sutton. However, in the same poll it was found that 68 per cent of the faculty members stated they did not support the boycott as a legitimate means of expression. Still, on top of the apparent contradiction by faculty members of whether to support of sympathize with the boycott, 50 per cent of those members polled said they would support a student strike by making course work provisions for students on boycott or strike. Sutton said the results clearly shows that "the faculty is yet to be heard from." Sutton also commented that "some" faculty members have already volunteered to forgo their salary increase in an effort to ease the proposed tuition hike. The poll, Sutton said, was made by a group of private "concerned" individuals who were members of the Coalition to Fight the Tuition increase. THE POLL In sympathy with movement to fight tuition increase Yes: 76 per cent No: 24 per cent total faculty members contacted with answers: 110 Do you support the boycott as a legitimate means of this expressions? Yes: 32 per cent No: 68 per cent total faculty members contacted with answers : 100 Would you be willing to make provisions for students on boycott or strike? Yes: 50 per cent No: 50 per cent total faculty members contacted with answers: undetermined Would you favor re-allocation of the budget line allocated for a faculty pay increase to aid student financial aid? Yes: 36 per cent No: 64 per cent total faculty members contacted with answers: 80 More Letters Are Planned for Iowa Several University students Friday started a letter writing campaign in an effort to contact presidents of the student bodies of Iowa high schools to inform them of the facts in the tuition increase fight and ask the to petition Gov. Robert Ray to take action. The students set up shop in the Union Gold Feather Lobby. Working at their own expense, they are asking University students to mail prepared letters to the high schools from which they graduated so that almost every Iowa high school will be receiving a letter from one of its graduates at the University. NUC Proposed Group To Determine Budget The New University Conference supports the demands of the Coalition to Fight the Tuition Increase and further proposed that a Coalition-appointed committee consisting of students, faculty and staff review the entire University budget. This committee shall reformulate budget priorities and reassess the University's expenditures in light of its primary objective : providing a meaningful education for all students. University managers claim that there is not fat in the budget, but they conceal the figures. If the managers have nothing to hide, they should welcome this opportunity to dispel doubt. The events leading to this week of protest are another indicator of the inadequate and anti-democratic mode of University decision making. We call for the establishment of a democratically constructed University Senate, comprised of students, faculty, and staff, with final authority invested in them. Mixed Reaction To Office Invasion Public sentiment became aroused Friday as word spread of the invasion of Pres. Howard Bowen's office in Old Capitol by a group of 15-20 black and white youths. Few legislators offered comment on the incident in which only minor damage was inflicted to the office. Sutton Questions Move to Research We are presently experiencing a crisis at the University of Iowa because the administration has given higher budgetary priority to the improvement of faculty salaries and recruitment than to student financial need. It is the intention of the administration to hire more nationally-known professors at $12,000 to $30,000 a year to teach three to six hours per week. This is not a poor strategy once an institution has decided to create a research university. But it is very poor strategy if our objective is to create a teaching university. There is some question whether the state of Iowa can support a research university and, indeed, there is little value in creating a fourth or fifth rate research university when it is within our power to create the best teaching university in the nation. The faculty of the University in open assembly and the student body and the legislature have never voted on whether the University should be a research center or a teaching center. It is about time that those who are most affected by priority decisions of this kind should take the time, the trouble, and the responsibility to make these decisions. It it more important to create a research institution at the expense of excluding four hundred low income students from the University of Iowa, or is it more important to create an institution renowned for excellence in teaching while making it possible for low income students to continue to attend the University? It is about tie all of us decide. Added Demands Hurt, Blacks Say Black students feel that the addition of the demands of the Black Athlete Union (BAU) to those of the Coalition to Fight the Tuition Increase may have "put the demands in jeopardy and have an effect on the Economic Opportunity Grant program" according to a black student interviewed Friday. The student said that the white students added the demands on their own. the blacks, he said, has wanted to work alone for their demands. Black students claim that the coalition, because it seemed to be falling apart after Tuesday's boycott of classes were merely looking for another issue. The addition of this new issue, the student said has only caused to confuse the original coalition demands. "People have confused and equated the two issues, which do not have anything to do with each other," the student said. The athletic department, he said was confused over what the blacks were trying to do by adding their demands and did not realize that this was not a move by the BAU for more support. The student pointed out that not the BAU but only three individual blacks spoke in support of the addition at Tuesday night's mass meeting when the black demands were added. In reference to Thursday's incident at University Pres. Howard R. Bowen's office, when several students entered and did some minor damage, the student said, "No one knows exactly who was involved. There were both black and white students but no one has any knowledge that this was initiated by blacks in connection with the coalition demands." EDITOR'S NOTE The first issue of the U of Iowa Student Report is published by Student Body Pres. James Sutton. The publication will attempt to give the University community comprehensive information related to campus issues and activities. The publication is autonomous. It is printed by arrangement with the Board of Student Publications, Inc. Editors.... Mary Clark David Dierks Black Image Not Correct By JIM SUTTON The Iowa public believes that the black race, and not a small group of blacks and whites upset President Bowen's office. All have been judged guilty because of the actions of a few. Consequently, finding sponsors for programs benefiting blacks will become difficult, Withdrawals of support have already been received. No one knows what effect the incident at Old Capitol will have on a proposed Afro-America student center. Each of us should make it clear to everyone that: no race can be condemned, important programs must continue to prevent affair from becoming worse, there are reasons for what occurred at Old Capitol which must be discussed there was little damage at Old Capitol, the event was purely symbolic, the incident was sincerely expressive, though, I believe , miscalculated. Unless we take responsibility for lifting the blanket of white guilt covering the black colony, that colony and our principles, will be smothered in white heat. Committees Set Up Students interested in working on any of 14 committees which have been set up to implement further action to fight the tuition increase may sign up in the Student Senate office in the Union Activities Center. Faculty Reaction Is Mixed Over Tuition By DAN CAMBRIDGE Action taken recently by the Faculty Senate to table a motion opposing any tuition increase at the University has caused many students to question where the sympathy of the faculty as a whole lies concerning the current tuition issue. At a April 25 meeting, the senate voted 22-14 to table a motion opposing "proposed recommendations that tuition at the University be increased significantly to meet the financial needs in the forthcoming hiennium." The senate's action has been interpreted variously as a betrayal of students, a yielding to administration pressure and a reaction to the spector of a faculty salary cut. Interviews with a number of faculty members present at the meeting seem to indicate that these views are either exaggerations or misinterpretations of the senate's motives for tabling the motion. The tabling action followed about an hour and a half discussion during which Pres Howard R. Bowen and Vice President Willard L. Boyd answered questions and presented the administration viewpoint on a tuition increase. Faculty members also made comments on both sides of the issue. According to faculty members present, the administration's presentation was strongly stated, but in no way coercive. George W. Forell, professor of religion, said that the "administration stated its case as forcefully as possible," He added that "more timid people might have been frightened by such forceful statements." However, be rejected the idea of any coercive administration pressure on faculty members present. Stow S. Persons, professor of history, rejected the idea of coercion or excessive pressure completely. "People who think that way simply don't understand the relationship between Bowen and the Council and Senate," Persons said, "Bowen has always treated them on a completely honest man-to-man basis, he added. Persons, who moved to table the anti-tuition motion, admitted that the matter of faculty salaries was on his mind during the meeting. "i am well paid and I don't expect a salary increase" he said. However, he added that he was concerned over the possibility of losing some faculty members and failing to attract others to the University because of failure to keep salaries competitive. Eugene Spaziani, professor of zoology, referred to a sentiment that he felt was held by most faculty members "of perfect willingness to forego any salary increase in the next year." However, he also mentioned the need of the University to stay competitive in the salary field and to raise non-academic salaries. All of the faculty members interviewed seemed to see the choice before the senate as one between supporting student interests and supporting the perpetuation of the quality of the University. Faced with only these alternatives, the faculty senate apparently felt it had no choice but to support quality. However, Forell pointed out that the faculty has no information to rely on but that given it by the administration. "I am not in a position to oppose because I have never seen," he said. Forell strongly favored faculty participation in the planning of the University budget. Although in the light of the purported threat to the quality of the University, the senate felt that it could not categorically oppose a tuition increase, there was no eagerness to vote against students by rejecting the antituition motion. Tabling was the alternative chosen. According to Spaziani the tuition issue "has not died with the senate vote." An ad-hoc faculty committee including "all shades of opinion," has been formed to pursue financial alternatives to a general tuition increase. The committee has been studying a graduated tuition plan now in effect at Michigan State University for possible application to this University. Forrell also predicted that there would be widespread faculty support for attempts to take the case against a tuition rise to the people of Iowa. "All the people here (in the School of Religion) would be involved to a man," he said, Other faculty members interviewed also voiced support for any "constructive" efforts by students to oppose tuition. 'Concerned' Students Meet With Regents In an informal discussion with the State Board of Regents and University administrators in Council Bluffs Thursday, a group of six "concerned" students called for a "state wide canvasing" of Iowa residents this summer in an effort to drum up more support for additional financial aid to the three state universities. Phil Dantes, A3, Waterloo said that they would try to organize students to convince residents of the "inadequacy of the appropriations." He said students can organize to visit "every home in Iowa" to discuss the issue. "I can't believe people will care," said board member Mrs. Joseph Rosenfield of Des Moines. "They don't believe it is worth it." she said, referring to Iowa residents. The six students said they represented no particular group on campus, but only that they were concerned over the proposed tuition increase and desired to speak to the regents personally to see what could be done. Discussion centered mainly around ways of cutting the University budget to make more financial allowances for lower income students. Rita DeMarco, A3, Palatine II, said that University Pres. Howard. R. Bowen and Vice President Willard Boyd told them there would be enough money in the budget to aid those students in financial trouble. But when one student asked Bowen and Boyd where the money would come from neither one answered. Dantes specifically asked the regents to join them and "stick their necks out" in trying to prevent a tuition raise. "A good dialogue was our first goal." said Dantes, but the group wanted the approval of the regents and administration to join together and present evidence in the form at budgeting reports to show the legislature of the need for more financial allocations. Sen. Minneette Doderer (D-Iowa City) said that she was encouraged by the students' concern , yet questioned the manner in which the students went about contacting the regents. "They should have gone through regular channels." she said, yet conceded that "students now a days are really too busy to know the ropes." INDIVIDUAL INCOME TAX $151,850,000 29.98% Corporate Income Tax $27,800,000 5.49% 1. 2. 3. Cigarette Tax $31,000,000 6.12% Inheritance Tax $17,800.000 Insurance Tax $17,800,000 3.36% Use Tax $22,350.000 4.41% SALES TAX $173,432,5000 34.34% 5. Liquor Control $17,500,000 3.45% 4. Fees and Misc. $16,475,00 3.2% Country Treasurers $17,600.00 3.4% 1- Beer Tax- $5,475,000 1.08% 2. Misc Tax- $170,000 .03% 3. Tobacco Tax- $697,500 4. Interest Tax - $3,850,000 .76% 5. Liquor Tax - $3,600,000 .71% The above diagram illustrates the proposed budget report for the State of Iowa, beginning July 1, 1969 and ending June 30, 1971. Note that the combined individual income tax, sales tax, cigarette tax, and inheritance tax, that represents the majority of personal taxes Iowa residents pay, is substantially higher than the corporation income tax which is only 5.49% clearly illustrating that Iowa tax payers allocate 68.4% more in personal taxes for education than do the corporations, who benefit the most from the educational system.